San Francisco, CA – As the use of recreational unmanned aerial vehicles, a.k.a. 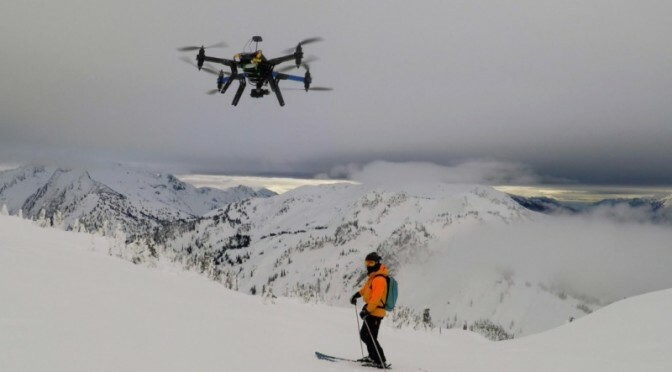 “drones” to film video is rapidly increasing in popularity, ski resorts — and the Federal Aviation Administration (FAA) — are scrambling to determine how to deal with this rapidly emerging new technology on the slopes. The FAA was supposed to release its final draft of new regulations regarding personal drone use by October 1, but missed its own deadline and pushed the date back to late spring 2016 — after the upcoming ski season ends at most resorts. Fearing impacts with other skiers, lifts or other infrastructure, the National Ski Areas Association (NSAA) has drafted its own set of rules banning the flying of personal and commercial aerial drones at ski areas, following discussions at NSAA Winter Conferences held last January at Killington, Vt., and February at Snowbird, Utah. In addition, commercial videographers who wish to film on U.S. Forest Service land need to obtain a special permit and pay a fee to the Forest Service prior to filming, whether they use unmanned aerial vehicles or not. Ski resort operators fear that without taking preemptive action, aerial video drones could one day become as ubiquitous on the slopes as GoPro POV cameras are today. In fact, GoPro has announced that they’re currently developing their own quad copter to market to consumers. Violation of the NSAA rules could result in drone confiscation and/or loss of skiing privileges, and in some areas potentially regulatory fines as well. At the same time, the NSAA is urging the FAA to allow resorts to fly their own commerical drones to assist in lift inspections, search and rescue operations and avalanche mitigation. Notwithstanding the NSAA rules, some resorts have struck out on their own and already issued their own drone bans. Among them is Crested Butte Mountain Resort in Colorado, which has already published its written drone policy on its website this winter. While ski resorts and the FAA work to sort out policies and regulations, one upstart company is looking to monetize drone use for both itself, and partner resorts through a revenue sharing agreement. Cape Productions plans to launch a commercial drone video service at at least eight ski resorts across the U.S. and one in Canada this winter, and sell a personal memento video to guests. The company has raised $10.4 million of capital from investors since its founding in June 2014. Under the plan, a participating guest is given a tracking bracelet to wear, and Cape’s tethered drones will follow the guest at speeds of up to 40 m.p.h. for about a half mile through a designated run. Cape will produce a 90-second to two-minute video and email it to guests for an estimated $150 fee. Cape has filmed riders in Canada under Transport Canada approval since last year and is approved to fly at Canadian resorts this winter. In the U.S., Cape has operated under Section 333 FAA approval since April 2015 and is currently working with the agency to finalize its approval for broader ski resort operations in the States. A Section 333 exemption allows commercial pilots to fly drones while the FAA works out its regulations. But a Section 333 exemption prohibits flying unmanned aerial vehicles within 500 feet of non-participants, an impractical distance for Cape’s ski resort plan, hence their effort to get the FAA to craft special regulations for ski resorts. They hope to have it all sorted out in time to launch operations in December. Cape Productions currently has resort partnerships established with Winter Park Resort (Colo.), Copper Mountain (Colo.), Timberline Lodge (Ore.), Mount Hood Meadows (Ore.), Powder Mountain (Utah), Homewood Mountain (Calif.), Mountain Creek (N.J.), Fernie Alpine Resort (British Columbia), and Schweitzer Mountain (Idaho). The company indicates that it will announce more resort partners in November. For their first on-snow camp of the 2016 season, the U.S. Ski Team partnered with Cape to capture training sessions with Olympic gold medalists Lindsey Vonn, Mikaela Shiffrin, Ted Ligety and other U.S. Ski Team athletes at Coronet Peak in Queenstown, New Zealand. “The unique camera angles we got and the stunning footage provided our coaches and athletes with a great experience and those images sent to our fans inspired us all. Our experience with Cape was exceptional and I have no doubt they will be successful in both the consumer and professional space with their technology and customer service,” said Mike Jaquet, Chief Marketing Officer for the U.S. Ski and Snowboard Association (USSA). Not all U.S. resorts, however, plan to completely ban personal drone use. Boyne Resorts, which operates ski resorts across the U.S. including Big Sky in Montana, Sugarloaf and Sunday River in Maine, and Brighton in Utah, is establishing “drone zones” in specific locations on the mountain within which personal drone operators will be allow to fly their aerial vehicles after prior registration, within the confines of any FAA or Forest Service regulations — current or future — that may apply. For safety reasons the resorts banned drone use for private individuals but they will be glad to provide that service for you, for a steep fee… because… safety. Hmmm.